German physician Gustav Jaeger (1832-1917) advocated wearing wool undergarments next to the skin for health purposes in his book Sanitary Woolen System, first published in 1878. Flannel and jersey underwear made of undyed sheep's wool was believed to conserve vital energy, prevent microorganisms from penetrating the skin, and wick perspiration away from the body. Jaeger considered linen and cotton undesirable because they retained dampness, causing illness. The doctor discouraged dyes, because he believed they contained harmful chemicals that were absorbed by the bloodstream. Dr. Jaeger's company made and marketed union suits, under-vests, corset, and socks; they were available to purchase directly from his depots in London and New York City, as well as through authorized mail-order catalogs. This rare, heather-gray wool Jaeger corset is a remarkable contrast to fashionable examples of the same period, made from rigid, steam-molded cotton coutille or dyed silk. The lightly boned knit stretched easily over the torso, making it a healthier and more comfortable alternative to tight-lacing. The Jaeger corset was part of a larger movement towards dress reform. Beginning in the mid-nineteenth century, many in the UK and US began to decry the supposed health hazards of women's dress. For those interested in dress reform, layers of petticoats and constricting corsets were considered cumbersome, unhealthful, and even dangerous. New ideas about dress took many forms, including Artistic dress, which was based on the relatively loose-fitting, draped garments of antiquity. Unlike Artistic dress, which was often discussed in terms of aesthetic appeal, Dr. Jaeger's woolen corsets were designed with health first and foremost in the doctor's mind. To learn more about the beliefs that led Dr. Jaeger's system of sanitary woolen undergarments, browse this 1886 edition of his essays. For centuries, corsets contorted the female figure into the reigning ideal. Bound to Impress: Corsets from The Helen Larson Historic Fashion Collection highlights these unnatural fashions between the 1760s and the 1820s. Whether conically shaped with rigid backs and flattened breasts or rounded hourglasses with sloped shoulders and cinched waistlines, garment silhouettes followed the dictates of these concealed undergarments. This exhibition covers sixty years—from the Ancien Régime, through the French Revolution, during the age of Napoléon, to the era of British Romanticism. The first aim of 18th-century corsets—often referred to as ‘stays’ or ‘bodies’—was to aid ideal deportment. Ladies were to have shoulders thrust back and down, and rigid, upright spines. Of course, these corsets also helped to achieve the fashionable silhouette: conical torso and round hips. This corset is made of sturdy wool and silk damask, and stiffened with baleen strips—a durable material cut from the mouth plate of baleen whales. Leather strips prevented fraying at the edges due to wear. Schedule a viewing of Bound to Impress by contacting Jim Nemmert at 949.851.6200. 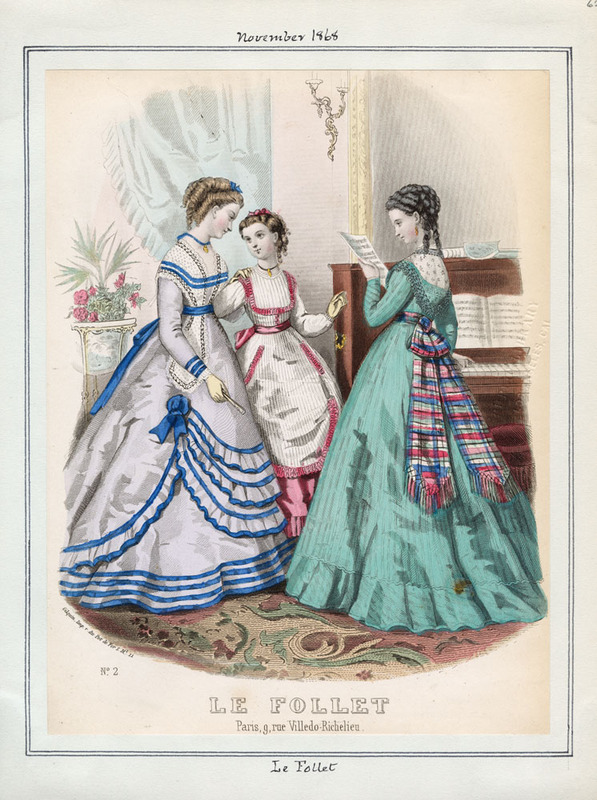 In the late 1860s, the fashionable bodice fit smoothly over a curvaceous corset that emphasized the bust. Skirts flared from a high, compressed waist, so corsets were shaped to place somewhat less pressure on the hips. The resulting silhouette, though hidden under layers of fabric, was a shapely hourglass. As seen in in our blue silk satin corset, godets at hip and bust allowed for a relatively roomy fit. Strategically placed whalebone, cane or steel boning shaped the corset, compressing the body into the desired silhouette. Because of its full bust and rounded hips, the wearer's waist would appear relatively small in comparison, regardless of its actual size. When fully laced and fastened, the waist circumference of this corset is about 22 inches.